My last name is Lithuanian and its pronunciation does not follow obviously from its spelling (which is also not easy to master). There had to be some fun in having such an unusual name. So in my youth, I got into the habit of joking on St. Patrick’s Day that my family’s original name was McRimdzius, but we dropped the “Mc” when we came to the U.S. to avoid anti-Irish sentiment. I don’t know what was more ridiculous, my story or that some kids seemed to buy it (until I started giggling). My ancestry actually does include a sliver of Irish. But it’s my given name that marks that fact, not my surname. 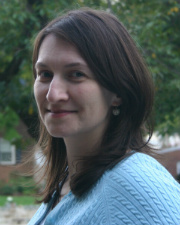 I’m named after my great-grandmother, whose last name was Tracy (which is Irish in origin). As if that weren’t enough, I also love the color green. 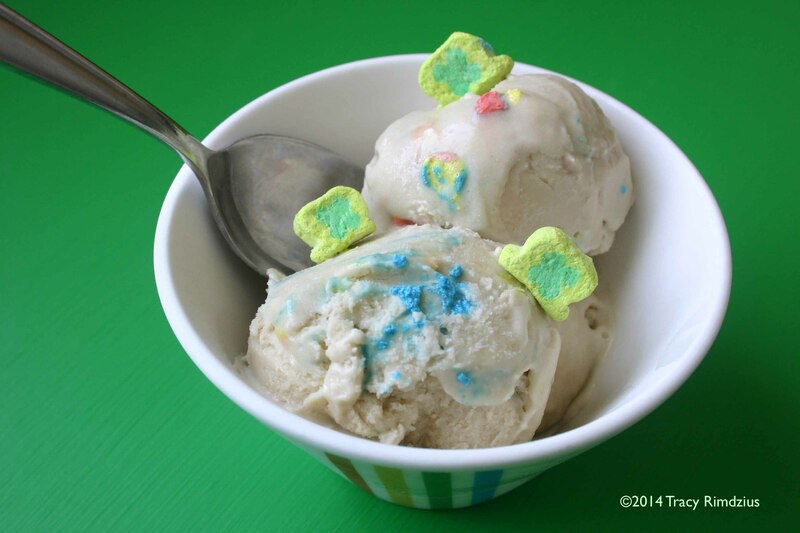 I’ve had a cereal-based ice cream on my flavor wish list for a while. It is an accurate expression of my lack of culinary prowess. When my husband doesn’t cook for me, sometimes all I can manage for a meal is to pour cereal into a bowl. I’ve also eaten ice cream for dinner. Why not combine the two? There really wasn’t any doubt in my mind about which cereal to try first. 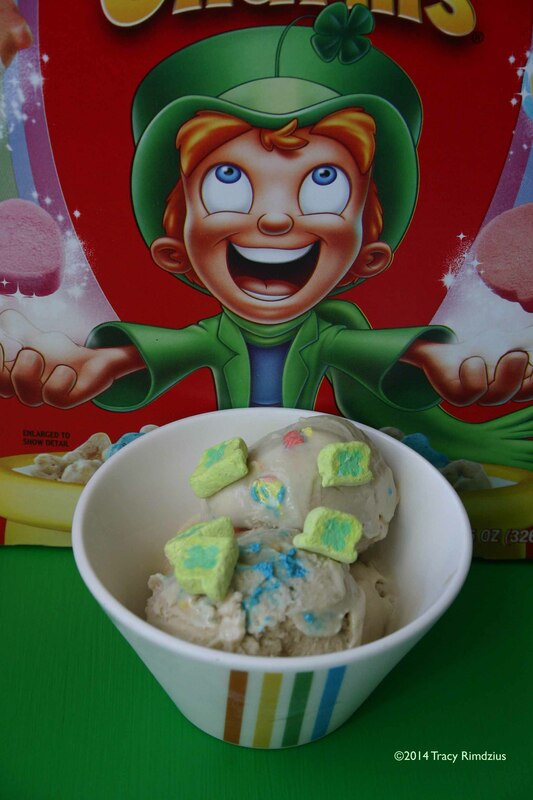 It was hard to even keep the Lucky Charms from accidentally falling into my mouth long enough to test this flavor. I still eat Lucky Charms the same way I did as a kid. I save all the green marshmallows for one last sugary bright bite at the end of the bowl. Somehow the green marshmallows taste better to me. This ice cream turned out magically delicious! Seriously, this is just like eating Lucky Charms cereal…not even remotely filling but so tasty you want to eat 6 bowls of it. (Am I the only person who accidentally pours too much milk on Lucky Charms so that I can add more cereal?). I’m always after his Lucky Charms. I wanted to have the flavor of the marshmallows as well as the frosted oats in the mix, but I learned the hard way the first time I tried to make marshmallow ice cream that there’s way too much cornstarch in commercial marshmallows to add them to the dairy before cooking. You end up with super glue. So I measured out the amount of Lucky Charms I wanted to use and separated out the marshmallows from the frosted oats. I steeped the frosted oats in the dairy for an hour, then strained and followed my usual method. After I cooked the mix, I strained it into a bowl with the reserved marshmallows and stirred until the marshmallows melted. After churning I added more marshmallows, because there are never enough marshmallows in Lucky Charms. I serve with yet still more marshmallows on top. You can order cereal marshmallows separately here. P.S. If you don’t get the title of this post, check out this video (Lucky Charms alert ~1:14). That looks so good!!! Yum!!! Maker of the best ice cream you've (probably) never tasted. All content © Tracy Rimdzius 2012-2018. All rights reserved.